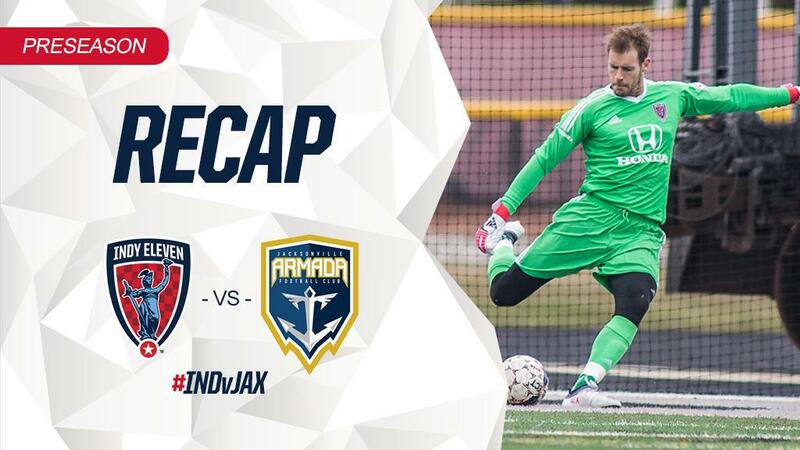 While several other USL teams opened their 2018 regular season accounts, “Indiana’s Team” finished its final preseason matchups, the first of which ended in a nil-nil draw against NPSL side Jacksonville Armada FC on Saturday. Indy started the match strong with the help from hard attacking moments by frontmen Soony Saad, Jack McInerney, and midfielder Ben Speas. In the third minute, Saad began his run into the top of Armada’s box, only to be cut short from a striking opportunity when three visiting defenders surrounded the Lebanese forward and removed the ball from his possession. Saad would get his chance again in the sixth minutes after sending a strike along the far edge of Jacksonville’s right goal post, but the ball curved just enough to hit the side netting out of bounds. Jacksonville got their first look at goal in the 15th minute. Armada midfielder J.C. Banks came dashing into Indy defending half, but quickly gained the attention of defenders Karl Ouimette and Reiner Ferreia. Feeling the pressure from the “New in Blue” defenders, Banks laid off a grounded pass forward towards a waiting teammate. Fortunately for Indy, the pass was a touch too hard, sending it pass Banks’ intended target and collected with ease by Eleven goaltender Owain Fôn Williams. It became Indy’s game in terms of possession as the “Boys in Blue” contained the Armada to playing in the midfield for a large portion of the first half. Short passes lead Indy into several, breakaway plays—several of which came close to scoring opportunities. In the 32nd minute, Indy defender Matthew Watson made his way forward through the midfielder after a chain of passing created a gap in Armada’s defensive formation. Jacksonville’s goalkeeper charged off of his line towards Watson to try and end the play, but the Redditch, England native responded with a cheeky chip over the trialing keeper. Sadly, the chipped ball got just far enough out of reach for Watson to attempt a shot and ultimately ended out of play on the right side of the goal. Continuing to ask questions, XI forward McInerney made his run at goal five minutes later. In the 37th minute, McInerney found himself in the center of Armada’s 18-yard box when a crossed ball came falling in his direction. As the ball came down, McInerney worked to deflect it into the net, but his efforts failed to materialize into a lead as the ball ended to the right of the goal once more. Jacksonville would get one more attempt before the end of the half. In the 44th minute, an Armada’s player came rushing in along the side into Indy’s half. Making his way pass Ferreia and midfielder Seth Moses, Jacksonville sent a hard, grounded cross from the center-left of Indy’s 18-yard box toward Indy’s right goal post. It was there another Armada player met the ball and sent a shot towards the net. But, the strike lacked the power to make it beyond Fôn Williams, who calmly collected. The second half started quickly in Jacksonville’s favor. The Armada were awarded a penalty kick in 48th minute after a challenge in the edge of Indy’s box—it was here that Jacksonville’s closest attempt at a goal died and one of the greatest moments for Indy shined. Armada stepped up to the spot and made a go to sink in the goal in the lower right corner, but Fôn Williams made a quick dive to deflect the ball back into play. Armada made two more attempts to score while Fôn Williams was still recovering, but both strikes were forced away by the Welsh international. Today’s back-to-back matches mark the end of preseason for the “Boys in Blue”. Next Saturday, Indy Eleven will make its USL debut as the squad hits the road to take on USL mainstays Richmond Kickers. You can see the “Boys in Blue” in-action in person on March 31st. Click here to get your tickets to Indy Eleven’s 2018 Home Opener at Lucas Oil Stadium against regional rivals FC Cincinnati. NOTE: Although there was no coverage of Saturday’s second match, Indy Eleven towered over Indiana Wesleyan University in a 7-0 trashing with goals from Brad Ring, Justin Braun, Nathan Lewis, a trialist and a hat trick from Juan Guerra. These updated stats now put Guerra level with Starikov in the leading poll for most preseason goals. The “Boys in Blue” end their preseason with a 4W-2D-1L record, scoring a total of 15 goals and conceding only three.